Once a grand estate of the Coleman Family with mansions, stables, an ice-house, and gate house, it lives on today as a community-focused park with an amphitheater, ball fields, and playgrounds. However, with more than half of the park remaining natural forest, it is home to some of the oldest and largest trees in Lebanon County. Hike the 1.6-mile nature trail to see specimens such as Sweet Cherry, Umbrella Magnolia, Chinese Toon, Black Gum, and Jetbead. 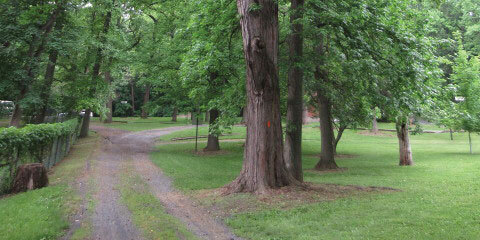 Coleman Memorial Park, also known as Coleman’s Park, is home to a variety of special events in Lebanon County. Throughout the summer months, Music in the Park provides entertainment in the park’s open amphitheater.